Since photography is based on light either natural (ambient) and introduced (flash), low lighting photo opportunities gives a photographer many choices on “how to take the shot.” Basic equipment should include a camera and tripod. The rest is up to choices about exposure and/or adding or subtracting light. This first image was taken at dusk. The sun had been down for about 15-20 minutes before I took this shot. I used a tripod to keep my camera steady. 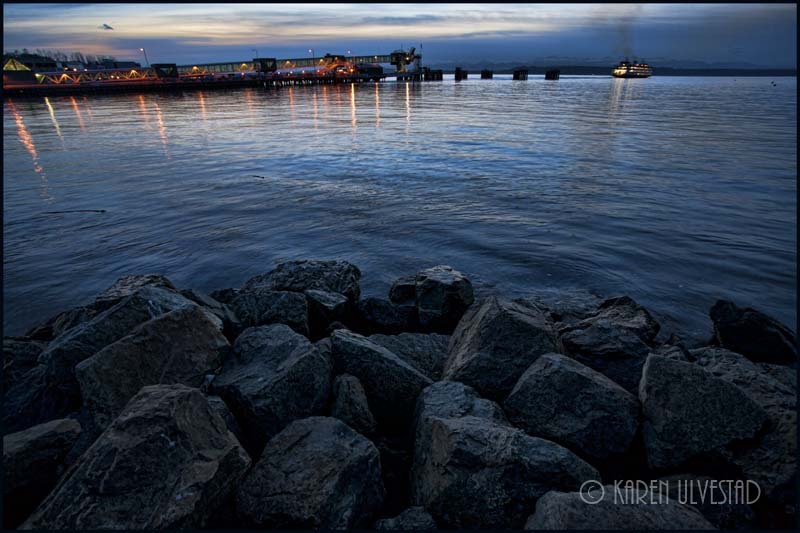 I wanted to capture the lights of the ferry dock, and have the rocks in the fore-ground lit as well. I exposed this image for the lights and last colors of the sunset. In the Digital Darkroom, I worked on bringing the exposure into balance, which reflected what I saw when I took the photograph. I worked a lot with fill light and contrast. In the photo below, I had a different lighting situation. This was shot during late winter, and the sun had already set or near sunset. 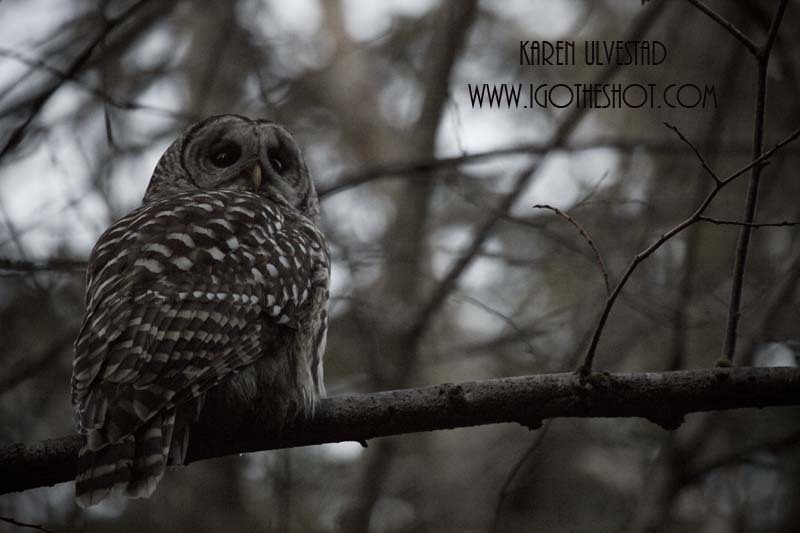 The Barred owl blended into the surroundings well, and I pushed the ISO to 2500. I didn’t know if the photo would turn out, because of the poor lighting. A flash would have been nice, but I would have lost the details in the background. The background would have gone very dark with a flash, because of the difference in light between the owl and the sky. 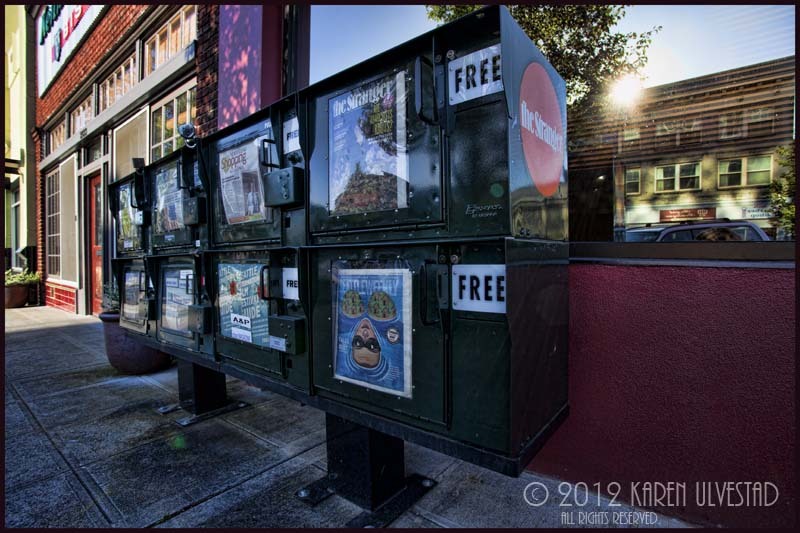 In the Digital Darkroom, I adjusted the exposure, and de-saturated the color. This is the final resulting photo. The scene below is a different situation than the previous two images. The lighting challenge is between shadow areas and direct sunlight. I chose an exposure in-between the two extremes, so I could collect enough details in the blacks and whites to work with in the Digital Darkroom. Even with this exposure, I still have some blacks and whites without detail. If one looks closely at the photo, the sun reflected in the window made refraction marks through the image. For more information about these processes, I’ll be teaching workshops on the subject, and writing about this in future blogs. My workshops are offered through Pacific Northwest Art School, Nature’s Photo Adventures, Sitka Center, and the City of Edmonds.